I worked on the free-to-play title, MechWarrior Online. Some of my responsibilities included environment art modeling, world lighting & world building, creating and maintaining all of the content pipelines and systems requiring art, technical art review, final art polish and level optimization, as well as leading the content creation teams in Agile Development. Early in the development of MechWarrior Online, I led a small team in the additional creation of the initial teaser trailer. 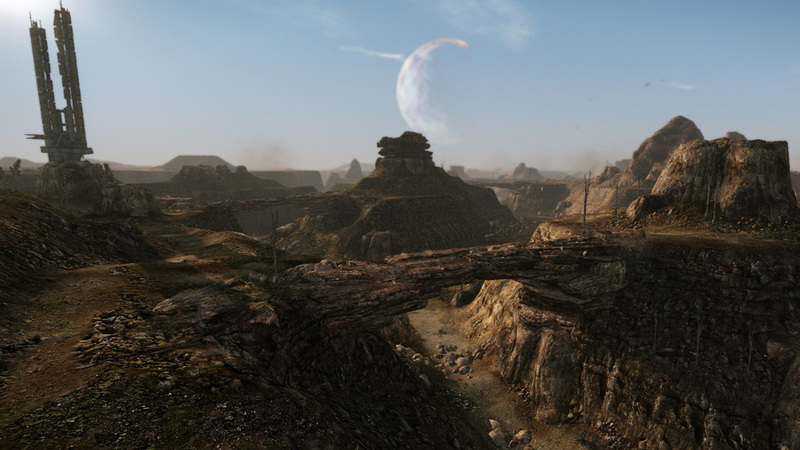 This trailer served as the first look at MechWarrior Online in CryEngine. Working from a concept piece, I modeled, textured, assembled, and lit, the Mechbay. I later repurposed this video Mechbay to work as the Mechlab (garage) in game. The Dropship Trailer can be found below. I modeled and textured this frozen and buried high-rise building. It was the first major building created for MWO, and it was used to help define the architectural style for the game. My direction was to mix brutalist architecture with a touch of sci-fi and art-deco influence. This building is also the highest point on this side of the level and is used as a navigation landmark. I sculpted this Glacial Cliff in Mudbox. This dominating wall of ice and snow not only acts as the play space boundary for half of the level, but it also features a crevasse that players utilize to potentially flank the enemy team. There were interesting artistic and technical challenges to overcome when making the cliff as it is not only incredibly large, but players are also able to get right up against it, so the cliff has to hold up visually whether it is viewed at 3km or 3m away. I modeled and textured this multi-tiered ramp & platform area with industrial funiculars. This section of the level is used to transition from the train tunnel route up to the high point of the city, so it is a frequently used choke point with interesting vertical gameplay challenges. There was very little surface area given in order to make the high vertical transition, originally designed as a single giant steep ramp - I pitched this terraced style multi-ramp play space to feel more natural while also providing a more interesting play space. In addition to global art beatification, world building, and lighting for Canyon Network, I also needed to model a number of gameplay sensitive objects. I modeled and textured the rock bridges, creating them in 3 pieces so that they would crash together easily to span different distances. I also modeled and crash kitted the large landmark radio tower / microwave tower / tuning fork. After releasing a number of low visibility, or highly alien lighting schemes, I wanted make sure that I didn't overpower the natural beauty of Canyon Network, and created a nice clear mid-morning lighting scheme. I cranked the sun size and god rays, added a tint of mauve to the atmosphere, and created two additional planets for the skybox to re-alien-ify it just a touch. I probably took the lighting for Caustic Valley through more iterations than any other level. A planet choking on its greenhouse gasses, providing that balance between player-wanted visibility and Kevin-wanted haze, while making sure that the entire world wasn't just a muddy giant green wash took a few tries. Less dense global fog, with more localized fog pockets and a highly scattered sun finally checked all the boxes for visibility and color contrast, while maintaining the thick atmosphere we were after. The aim for Crimson Strait was to add lighting depth through atmospheric moisture, while maintaining relatively clear sightlines. I also threw some extra color in the sun and sky to complement the red tide water that surrounds the majority of the level. Our first map (other than the dropship video), Forest Colony went through a number of style changes before it found its home as an all too familiar "west coast overcast rain" theme. Unhappy with prospects of living in grey and playing in grey, I upped the saturation of the fog where, while still muted, adds a nice amount of green and blue color throughout the level. There is also a nice dark, wet, cave through a side mountain which is an excellent excuse for night-vision enabled fighting and flanking. Channeling my Albertan roots, the Frozen City level features sudden weather changes - from snowy and cold to extremely snowy and cold. Although generally blanketed in the storm, players can also find themselves fighting through moments of sun-blindingly clear skies only to be engulfed by an almost 0 visibility fog and snow storm seconds later - alternative vision modes can reign supreme here. The sun is still managing to cut its way through the smoke and ash that clogs the air in River City, tinting the world a deep yellow/brown color, while giving me a nice opportunity to crank the god rays.